Every girl needs to have a suede skirt this fall. We’re already halfway through fall and it just keeps getting colder each day. The weather may force us to bundle up but it doesn’t mean we have to sacrifice style over comfort. I mean, why choose one if you can have both? I, personally, love wearing skirts and the season is definitely not an exception. The key to wearing skirts this fall is to find something that is made with thicker and heavier fabric— like suede skirts. I really thank the fashion industry for suede skirts. For me, it’s fall and winter’s version of summer dresses! Suede skirts are first introduced in the fashion world way back in the 70s and I’m glad that it’s becoming a trend again. It’s great for casual and everyday wear and is also great for a date or a girls night. Suede skirts are very basic. A lot of girls think that suede skirts are intimidating but truth is, suede skirts are versatile. You can pair it with almost any top, sweater or accessories. If you are just starting to know your style, suede skirts are the best to start with. Since it matches almost anything, it’s easy to transform your style with a suede skirt. Hanging out with friends? Achieve that casual look with a suede skirt, a t-shirt and a pair of sneakers. Going to work? Opt for a suede skirt, a cute top and some accessories. Going to a rock concert? A suede skirt can bring out that rocker vibe if paired with a printed tee, a leather jacket and a pair of leather boots. Wearing a suede skirt is an easy way to be in style without exerting too much effort. And since it is currently in style, you can find suede skirts at any stores for an affordable price. I’m sure it will be worth every penny as you can wear it in so many ways! I’m currently obsessed with this red suede skirt I bought at Forever 21. I love how it makes my outfit more sophisticated without trying too much. Plus, the color red, gives a touch of classiness and a little bit of vintage too. 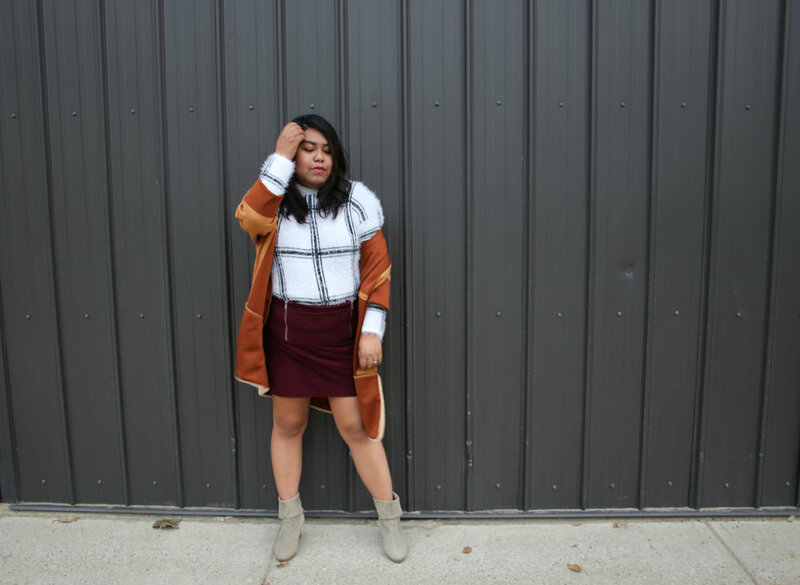 I opted for a casual fall outfit look and decided to style my suede skirt with a white sweater. White is a safe pick when you’re mixing and matching clothes and the details of the sweater add more color to the outfit. I also paired it with a trench coat for that extra layer and style. As for the boots, I decided to wear a pair of ankle boots I got on sale. It has heels on it but it’s surprisingly light. I didn’t have a hard time walking and my feet didn’t hurt at all! This outfit is perfect great for school or for an afternoon date with your friends.